One of our favorite online tea providers is ThePuriTea.com. They are a family business who decided to share their love of tea with the world. With a simple mission of providing gourmet teas and practical teaware, ThePuriTea.com sources all of teas and teaware directly from China, Taiwan and India. Currently ThePuriTea.com is offering 10% Off Entire Site or 15% Off Orders $100 Or More. To make it even better you'll receive a Free Sample On All Orders. If you're not satisfied you can simply return your order. If you're new to the world of tea but ready to take the plunge you might want to start with the Tea Starter Kit. While you're at it put up some of the fans favorite Red Dragon Pearl Tea. 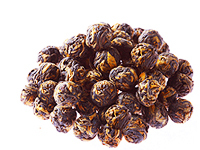 This unusual black tea is hand-rolled into spheres the size of chickpeas in southern Yunnan, China. Try it with breakfast, brunch, grilled duck or dark chocolate.